I Am Setsuna attempted to shoot for the moon in imitating games like Chrono Trigger, but just couldn’t quite manage. The 90’s are known for a lot of things, but in the video game world, two things stand above the rest: FPS Shooters and RPGs. The 1990’s brought us DOOM and the slew of shooters that followed, but it also brought us some of the greatest RPGs of all time. Games of that era focused on character development and story, but also brought fantastic gameplay to the table. During this span we saw some of the best installments of the Final Fantasy series (IV and VI), as well as what I personally consider the greatest RPG of all time; Chrono Trigger. With its phenomenal cast of memorable characters, deep and intriguing combat and combo tech system, and rich story full of twists and turns. I Am Setsuna did its best to imitate the best things about Chrono Trigger (the memorable cast of characters, intricate combat system, and lucious story full of twists and turns), but it just couldn’t quite get the job done. No need to pray for snow, its pretty much everywhere you look, dominating the aesthetic of the game, and does little to help the emptiness conveyed on the world map. I Am Setsuna does what so many other games have done of late, trying to make a tribute to the great games of the past. 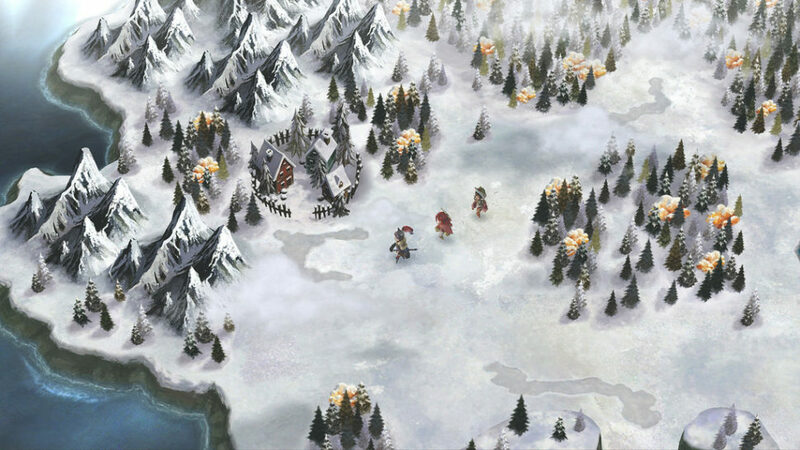 Setsuna pays homage to Chrono Trigger in the form of its world map as well as its combat system, however, it sorely lacks the depth and memorability of its muse. Setsuna’s general aesthetic is at first gorgeous, but the snow gets somewhat tiring when it’s the only thing you see. There’s no variety in the environments, between caves, towns, and the outside, it all blends together. The overall look and sheen of the game is great, and looks polished on TV mode, but when it comes to handheld mode, it feels like somewhat tarnished. There are quite a few other elements of Setsuna that feel bland, and devoid of effort after the bare minimum. Enemy models are few and far between, and tend to utilize simple recolors in the later dungeons, and even the extra difficult optional mini-boss enemies were near impossible to tell apart from their cohorts. The mechanics are poorly explained, and the lore of the game, dubbed the “Snow Chronicles”, leaves a lot to be desired. Tutorials are few and far between, and you can’t reread what you’ve found – figuring out the momentum system was a huge pain (I had to google how it worked). After the initial information dump for a new mechanic early on, you never really hear anything about it again. I Am Setuna’s saving grace is its combat system. Despite a general lack of difficulty, the combo tech’s and spritenite mechanics helped the game shine behind a time-tested active battle system (once your character’s bar is full, you can select an action – if multiple are full at the same time, you can unleash a devastating combination attack). That being said, battles quickly became routine and boring. Unlike a game like Persona, I never really had to think about how to tackle a group of enemies. Typically I’d use the same party, with the same set of moves to wipe groups of enemies in 2-3 turns via attacks and magic. Magic is imbued to each character via purchasable spritenite – similar to the materia system in Final Fantasy VII, except they are all character specific. You have the ability to purchase multiple of each spritenite, but I never saw the point in doing so, as you could only equip one at a time. The merchant system is somewhat odd as well. You don’t make money off battles, but instead sell the monster parts you salvage from countless victories, and then spend that money on weapons. However, you can’t sell any of the weapons you already own to recoup cash when you upgrade a sword or knife. It seems somewhat odd, as my older equipment just sat in my inventory, and I never had any use for it once I bought the newest shiniest weapon. 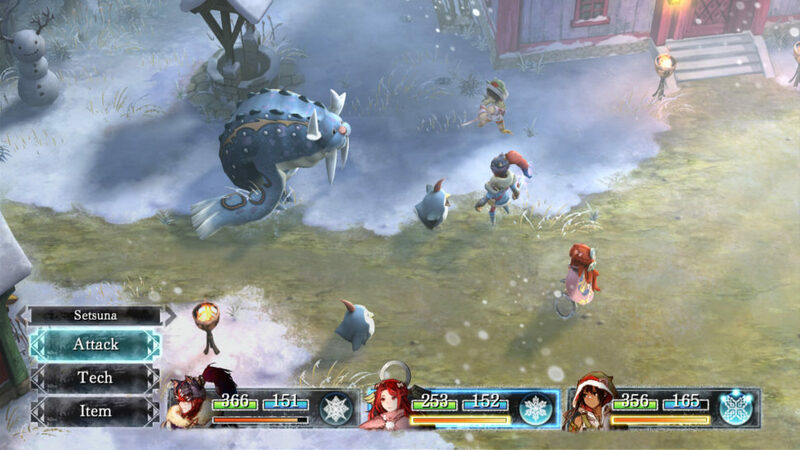 Combat is Setsuna’s saving grace, offering a well done active battle system with a fluid and stylish combo system. Setsuna’s story, while unique, offered no world shattering twists or turns. In a world full of monsters, a sacrifice is offered up to fend off the tide and buy humanity time. This cycle, its up to you to guide the sacrifice through her journey to The Last Lands. I found myself expecting pretty much everything to happen, and despite having the choices for dialogue, nothing I ever chose to say really mattered. The characters were all extremely forgettable, with nothing endearing about them. I never felt any kind of emotion when the game tried to convey one revelation or another. It feels like a lot was planned for I Am Setsuna, but little was actually realized. Throughout the world map, there are swaths of empty areas, from deserted towns to prairies, to some ruins. I expected some kind of endgame content or optional dungeons, but was sorely mistaken when all I really had to do was go beat the final boss. The game isn’t bad by any means, it’s just simply mediocre. It conforms to what the genre has already done, but moved past in the last 20 years, without really adding anything of its own. Where games like Shovel Knight bring out the best of nostalgia while leaving the worst we’ve forgotten, I Am Setsuna doesn’t really bring the best or worst of anything. It tried to do many things, and succeeded to an extent, but failed to surpass any kind of expectations. However, on a device with limited traditional RPG options, Setsuna will scratch that itch if it exists, and generally get the job done, but its $40 price point is somewhat hard to justify. I Am Setsuna tries to imitate a lot of what Chrono Trigger did well, however it just can't quite manage in many areas. A lot the mechanics are clunky and unintuitive, but the combat system itself is very fluid, despite a lack of challenge from enemies. There was a huge opportunity for this world, that failed to materialize, with tons of empty areas that felt like content was planned for but scrapped. While not a bad game, Setsuna fails to shine and remain strong in my memory.